I keep thinking about that 2k next week. I keep thinking about the last 2k erg test when I just folded up. I like every other rower who chokes does so because of the pain. Or the expectancy of it – even 4 minutes before it actually arrives. But this time it’s different. I have a new plan. I leaned something very important from someone who’s been there before. Someone who overcame mental collapse at 2k erg tests. Many times before he discovered what to do about it. There are 2 main types of fitness. First is physical. The second is mental fitness. Rowing on the erg trains this also. But not that much. Ok I hear you say. But what about all those hard rowing sessions, hour long ergs, 10k ergs or the dreaded 3 x 20 minute erg? Yes I admit that those sessions do train you to be tough for that exact type of training. 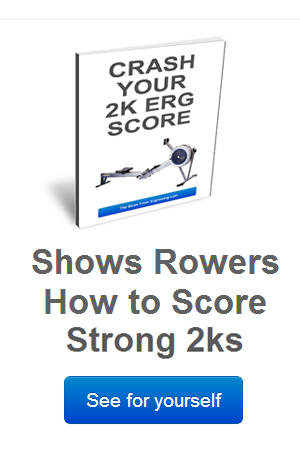 But 2k erging is different. You need to get acclimatised to taking pain. Dealing with it. Tolerating it. In a word – Training. Both physically and mentally. Doing repeated hard short rowing physical intensity will train your body. Buy it will train your mind more and you will grow accustomed to hardship. And like all rowing training you must time it perfectly. Only do it for 2 – 3 weeks max before the 2k test. Otherwise you will get tired and will break down. I like doing 5 minutes all out. Or 1000 meters flat out. Repeats. A few times a week (2 max). 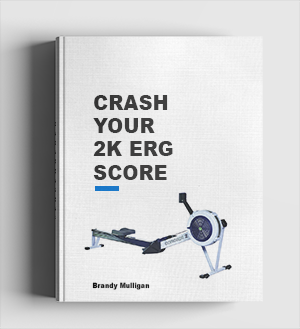 Have a look at my 2k erg race winning plans article, where I describe exactly how to prepare physically (and mentally) for the 2k. I guarantee you that a hardened mind will not give in easily on race day. Most mental rowing breakdowns happen because of a fear of what’s to come. Long before the really hard part arrives, you are thinking too far ahead and imagining how bad it’s going to feel. And it never really comes because you fold up. The mind it a complex machine but by pushing the right buttons it can be manipulated. If you can begin slower than usual (1 – 2 seconds per 500 split) for a few hundred meters (200 – 400) you will give your mind and body a chance to be fooled. Tricked into believing that it’s a good day at the office and that it will not hurt that much. Then slowly allow your confidence to grow. Steadily and surely release your shackles. Break free an allow yourself to flow. And ultimately unleash hell on that erg. To the line. Got a 2k erg test today for my team. This helps a lot and I thank you. Im 14 and this just helped me pull a 3:26 1k thank you!